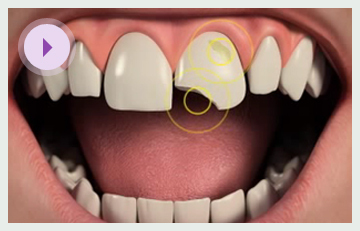 A small chip to a tooth near the back of your mouth can usually be rebuilt with a filling. A tooth-coloured composite material can often be used if the chip is not too large and such a repair is generally unnoticeable. Your dentist may have to drill the tooth to remove any decay before the filling is placed. If you have a small chip on your front teeth, your dentist will likely use a composite filling to repair it. Using a tooth-coloured composite (matched to your tooth colour) your dentist will mould the material to re-form the previous shape of your tooth. Your dentist will apply a gel to the affected tooth, followed by an adhesive and the bonding material. This material is then shaped and then cured (hardened) using ultraviolet light. This procedure can also commonly be done in a single visit. When a large piece of tooth has broken away a crown/cap may be the best option as they are stronger than fillings. Crowns are tooth-shaped caps that fit over the top of your teeth and can be made from metal, porcelain or composite material. Each material offers different qualities and the options will be explained by your dentist. The tooth will generally need to be shaped/prepared so that it is a suitable shape for a crown. A mould/impression will be taken of the prepared tooth and commonly sent to a lab so that a custom-made crow can be constructed. A temporary crown is often placed on the tooth whilst your permanent crown is being made which can take up to two weeks. The crown is then fitted at a second visit with special dental cement. When a front tooth is chipped and the fracture is deemed too large to repair with a filling a veneer may be a suitable option to repair the tooth. Dental veneers are thin slivers of porcelain or composite resin material, which are placed over the whole front of your tooth. Your dentist may need to lightly prepare your tooth by removing a layer of enamel, and will take impressions of your tooth, which are sent to the laboratory for your veneers to be made. This can take from one to two weeks. The colour of the veneer is matched to you natural teeth. Once your veneer is ready, your dentist will use a special bonding material to fit the veneer to your tooth. There is further information on veneers in the broken teeth section found in the 'I'm in pain/discomfort' menu.